Four piece Sons Of Icarus have achieved a lot since winning the Marshall Amplifiers’ ‘Ultimate Band Contest’ in December 2010, which led to opening slots for Download and Sonisphere in 2011.This has led to further festival appearances over recent years and has seen them support a whole host of major bands such as Black Stone Cherry, Clutch, Rival Sons, Orange Goblin and most recently The Cadillac Three in London as part of their UK tour. Based in Guilford, Andy Masson (Vocals/Guitar), Steve Balkwill (Guitar), Alex Masson (Bass/Backing Vocals) and Mike ‘Quilly’ Mcquillan (Drums) also released a debut EP that was picked up by radio stations including Planet Rock and Team Rock. The EP is 4 tracks of sheer brilliance. Opening with ‘You Want It All’ with its heavy riffs and slight stoner vibe, the outstanding vocals immediately catch your attention as they powerfully rise off the scale in the song. With a delicious rhythm behind it all, the song has all the elements to make it sound amazing. ‘Not Myself’ is full on rock riffs at an almost frantic pace with the vocals matching the pace. Hard hitting drums and a hooking bass line compliment the speed of the track and it is just a wall of epic sound at full force. ‘Can’t Let Go’ opens with thunderous sounding drums that resonate through the track, with a dirty sounding riff and rhythm section that is a real powerhouse in the song. More high octane vocals are on this track and it is addictive to listen to. ‘Sick To The Teeth’ starts off slower than the previous tracks with a delicate guitar backing powerful vocals before the rest of the band join in to create a rush of sound. Although slightly slower than the previous track, the massive stoner grooves behind monster riffs manages to make you feel totally immersed in the sound. At the very first listen to it you can’t help but be stunned at how good the band sound for their first EP. 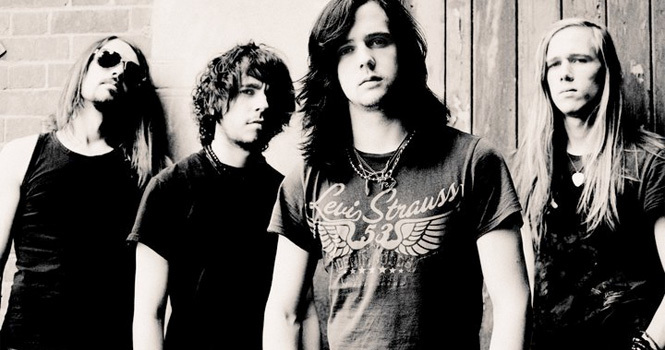 RARC saw them live at The Cadillac Three gig in London and they put on a blistering opening set that night. Sons Of Icarus are definitely a band to see live, the songs sounding brilliant and the band put on an electrifying performance that was as memorable as the headline band. No doubt Sons Of Icarus will have another year of delighting crowds across the country with more touring in 2015 and when a band sound this awesome you can only hope that more studio time is also on the cards. This is a band that needs to release a full length album as a handful of songs are never going to be enough and you are always going to want to hear a lot more from them.